Pi4J (by default) uses an abstract pin numbering scheme to help insulate software from hardware changes. Pi4J provides a RaspiPin enumeration that is used to manage the accessible GPIO pins. The Raspberry Pi 3 Model B board contains a single 40-pin expansion header labeled as 'J8' providing access to 28 GPIO pins. 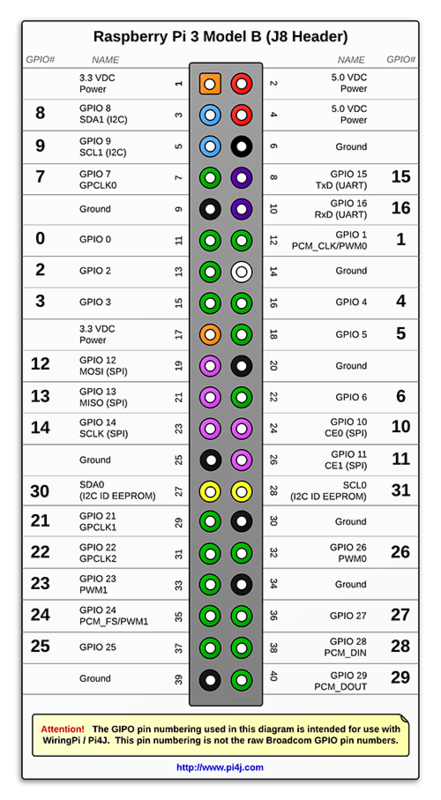 The diagram below illustrates the GPIO pinout using the Pi4J/WiringPi GPIO numbering scheme. Please visit the usage page for additional details on how to control these pins using Pi4J. Click here for more information on the J8 header. Click here for more information the Raspberry Pi pin functions.